STORY: Your girlfriend Madison was taken willingly by the US military because of a pandemic that has ridden the world of 99.9% of the world’s female population. A sequel builds on the story further, but for this game that is all you need to know. You, as the game’s heroine must go and reclaim her while building an army of your own to combat the male gangs that haunt the wastes of the world. The female prizes claimed along the way are known as “Queen Lords” and are the most precious items in the new world. CAMPAIGN: First of all this game reminds me of those Coin-op arcade games, and plays similarly to it. IE, you have a short goal per mission, and must do it. This includes clearing all the enemies on the stage, or bringing all the “Queen Lords” AKA, the flags, back to your base. Also, point A to point B navigation missions are included. The game never gets any more complicated than this. But this simplicity is what makes BattleTanx easy to pickup and play, and strangely addictive. Continuing with the arcade feel, you gain points for picking up powerups and destroying enemy tanks. Collecting enough of these points will reward you with an extra life. The life aspect is a little bit annoying though since this was a home console game never actually released in an arcade, and there are a couple of levels that seriously wish to drain you of your lives. Still, it is usually very possible to build up a boatload of lives over the course of the game so you are never cursing for losing halfway through the game. 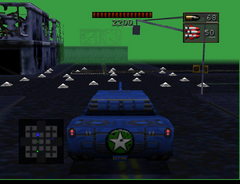 In between a set amount of campaign missions, usually at the end of each cleared “theme” you are given a mini-game where you control your Tracked Goliath tank and must hold off an unlimited amount of enemy tanks rushing you in waves. This was always fun to do, since the waves got progressively harder. Eventually they peaked at a difficulty, though it was very difficult to go on forever. And forever it did go. I remember when using cheats you frankly had to self-destruct (press All C buttons at once) to end. These sections helped with the lives if you ever needed them since lives were easy to get here. The single player isn’t very deep. However, while it lasts, it is a nice diversion. Every tank comes with their basic gun. Along with this are powerups littered around the stage. (Or in multiplayer, each faction gets one or more beginning powerups). Some of the powerups grant defensive advantages, such as shield, cloak or radar. While others are offensive, such as the grenade, laser, missile, or nuke. Almost every offensive powerup can be combined to form a more devastating version. This feature felt somewhat undocumented, so unless you fished around in the manual, the game wasn’t going to tell you about it. In addition, the requirements for the “Special” mode seem to differ for each one. Lastly, one is unlikely to reach the amount needed for the Overcharge without dying first, unless they are really trying for it. Examples of the Overcharge include: a grenade that grows bigger and then explodes with a large blast, a seeking missile that you can fire lasers out of that does extra damage on impact, and extra large gunbuddies. The special usually uses all the reserve of your powerup, but they are worth it. TANK TYPES: There are 3 types of tanks. The slow but beefy Goliath, the average Abrams, and a speedy but lightly armed motorbike tank. Overall the game favors the Goliath as it can dominate all the others on its own, despite its speed. It can also crush the motorbike assuming it can get close enough. Unless you are playing the Battlelords gametype, there is really no need to choose anything else. Here lies the problem. You cannot choose your tank. You are randomly selected a tank out of the faction that you choose (in multiplayer). This might seem fair, but you can just self destruct till you get the tank you want, so you might just try for the Goliath in your gang every time. This means human players may just kill themselves till they get the Goliath, and the game becomes Goliath vs. Goliath a large part of the time. A special base defending Goliath reaps havoc over the battlefield, as it can move as quickly as a motorbike sideways and fires at twice the rate of a normal Goliath. You cannot heal this behemoth, but if you can kill your enemies on the rail, you can pick up the rejuvenating star. One thing I liked was the option to remove the tank from the rail. While you would probably never want to do this, it is nice to have the option included, along with the lovely creaking sound it makes when it does so. I’m not sure why the developers decided to include ammo in the game. I guess they were feeling low on powerups, but frankly, ammo is useless. You will rarely, if ever run out before you die. If you perish you get more ammo anyways. The only tank that needs the ammo is the machine gun on the motorbike. All other tanks are strong enough to complete the mission with the allocated amount. MULTIPLAYER: This is an unbalanced game for multiplayer. It depends on gamertype, but overall, a certain type of tank will come out on top. 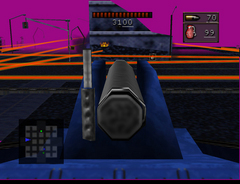 In the annihilation gametype you must destroy the armada of opposing tanks; every tank has only one life. 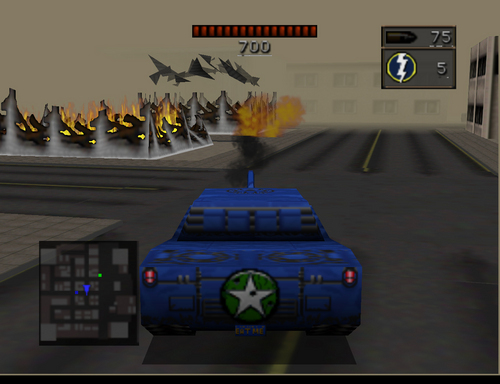 The Nuclear Knights have all Goliath tanks, and a nuke. This means that they will win a majority of the time unless you are also playing the Nuclear Knights, then it comes down to play style. However, in the Battlelord gametype (Capture the Babe), the motorbike tank is nearly unstoppable has it speeds past defenses and is hard to catch up too and hit. The computer opponents are challenging, but predictable, human players make multiplayer a blast. Up to four people can play, so for an N64 game, everyone can play something else besides Smash Brothers and Mario Kart. REALLY help you much, but hey this is the 21st century, and it looks good. The explosion and wailing of a nuke and the shockwave are sure to please most. Destructible buildings are eye pleasing as their balconies shatter into polygonal pieces. Tank shots are good looking with smoke trails with nicely matching sound. The spaceship’s teleportation vortex is also nice. The flaming on the walls after being hit by a tank shot looks high quality and beats out some shooter games in quality. Overall, there isn’t anything super next-gen (for the time) for the time, but it all fits together nicely. ACCESSORIES: Not only did this game support rumble, but it also had saving to the memory pack as well as level codes. That way, even if you didn’t want to use precious blocks on this game you could get back to the level you left off with a code. How’s that for a cool little extra. 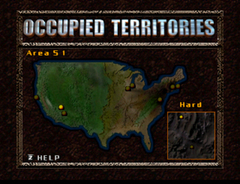 CONCLUSION: Probably one of my favorite games from 3DO. If you don't have this game you don't know what you are missing. If you can't find it, atleast pick up its squeal for some massive tank destruction. Awesome review! 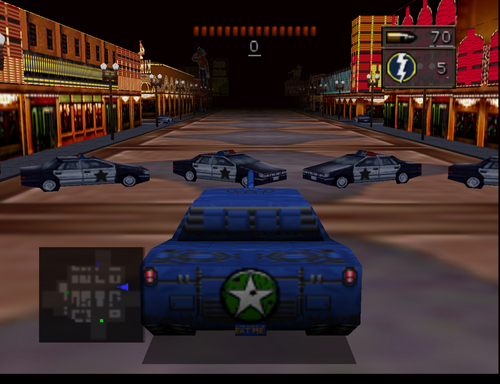 I remember playing that game back in the day. It's a classic for me.